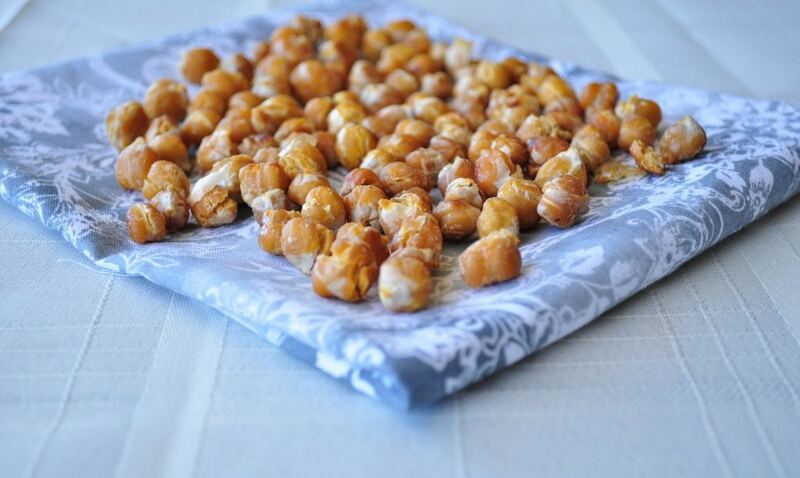 Maple Cinnamon Roasted Chickpeas. Nut free, gluten free and vegan. This may be the easiest snack you ever make. Seriously. You need to try them asap! First, I found Kale Chips, and I thought I was in love. Then it was Cauliflower Popcorn. But this snack beats them all hands down. It will satisfy your sweet craving without adding the pounds. Even my daughter, Meadow, who claims to hate all beans, ate them. In fact, she grabbed the bowl away and took off with it! Man, she is a sneaky one sometimes! It was gone pretty darn fast. I am roasting another batch as I type this. Here is a little video of how to make them. For more videos, you can subscribe to my You Tube Channel. Looking for more roasted chickpea recipes? Pour the mixture onto a parchment lined baking sheet. Roast in the oven for about 45 minutes, shaking every 10 minutes to keep them from burning. That’s it. Easy peasy!